When I first looked at the Stampin’ Up! 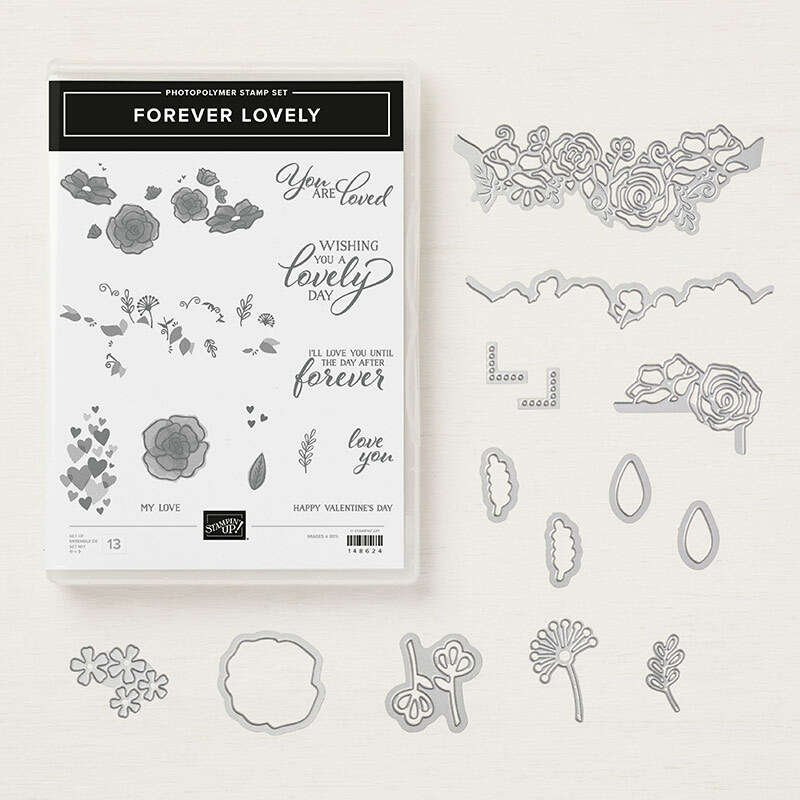 Occasions Catalogue, I skipped over the Forever Lovely stamp set and bundle as I thought it a Valentine’s Day set. But upon closer look, it really works for many occasions, like this beautiful card idea that I got in a demonstrator card swap. It uses a bunch of products from the “All My Love” Suite, but yet, is not a Valentine’s Day card. It is just a beautiful card, wishing someone a lovely day. I think anyone would be happy to get this card in the mail. The bundle is the stamp set and the dies. The dies cut out some of the images in the stamp set, but also cut out a lovely edge that allows the stamp sets to peek through. You can see the dies in action in my Instagram post today HERE. The Designer Paper, All My Love, is the most surprising find. 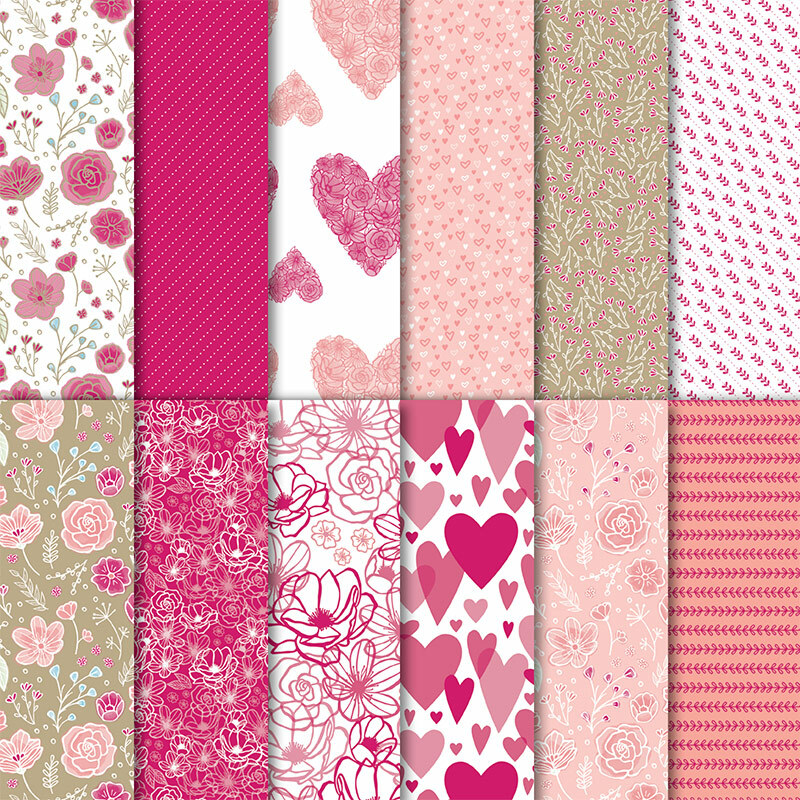 The paper does have hearts on it that definately look like Valentine’s paper, but the reverse sides of these papers either have some gorgeous floral designs or geometric patterns that can be used for birthday cards, thank you cards and more. One of the things I love about using Designer Paper on a card, is that it sets up the colour scheme for me! The colours on this card are directly pulled from the Designer Paper. Even the little die cut is in matching Soft Sea Foam. I just wanted to point out two other design elements on this card that I think are lovely. 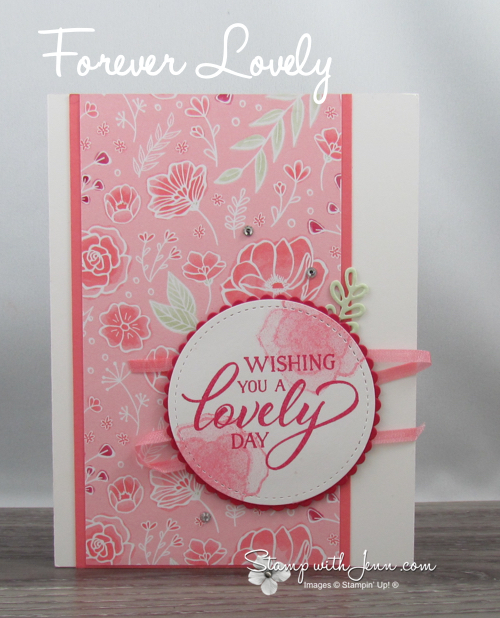 The little tiny Soft Sea Foam die cut poking out from the scalloped circle just added a little interest. And the ribbon that is laid down in a “Z” pattern is a fun and different way to use your ribbons. You can see all of the items used on this card below. And click on image to view the item in my Stampin’ Up! Online Store. 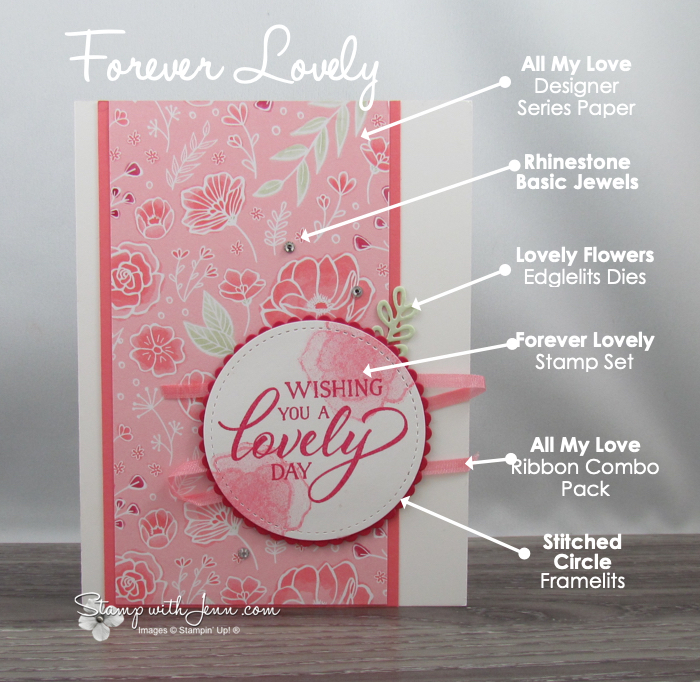 Be sure to check back to www.StampwithJenn.com later this week for another card using the Forever Lovely Bundle.